JOHN K. GREENWOOD. One of the men who by personal sacrifice and by persevering industry wrested a home and fortune from the wilderness, and one who will long be remembered by those among whom he made his home, is he whose name heads this brief sketch. During life he was a prominent farmer and an early settler of this county. The birth of our subject took place May 8, 1812, in Boston, Mass. His father, John Greenwood, was born near the same city, December 14, 1780. The latter was a carpenter by trade and engaged in that occupation in his native county before coming to Illinois. 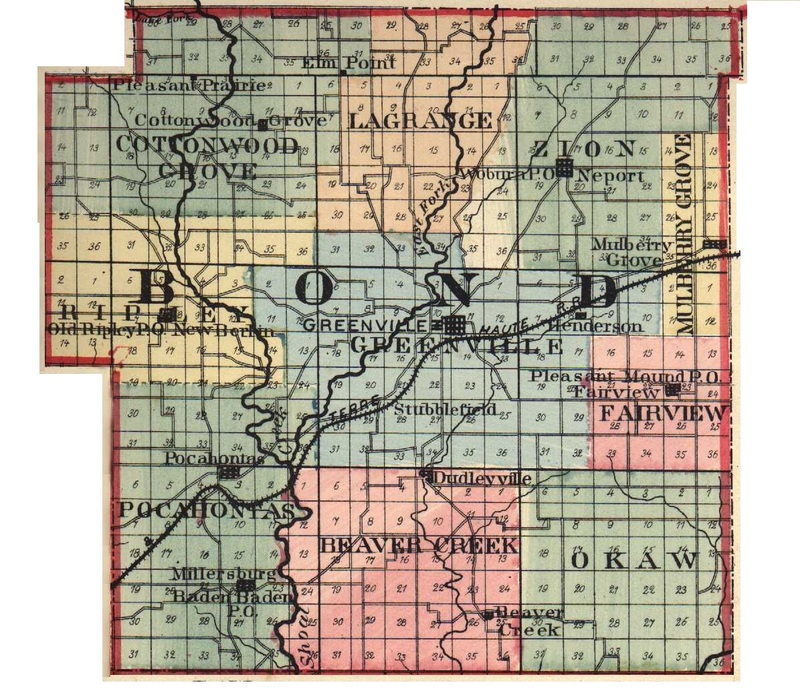 In 1833, Mr. Greenwood, Sr., came to Alton, Ill., on a prospecting tour, and in 1836 he returned to Illinois, where he worked at his trade for the following two years. The journey from Massachusetts was made by cars, and boats down the Ohio River and up the Mississippi, and location was made on the present farm of our subject in 1839. At that time the whole country around here was covered with woodland and there were no improvements whatever, but as both men were carpenters the erecting of a neat frame house was a very easy task for them. The father continued to reside with his son until his death summons came at the age of eighty-one years. Our subject came to this place at the same time as his father, and after spending several years in Alton, settled on his present farm, which he cleared and developed as rapidly as possible. At one time he owned six hundred and forty acres of land, but sold off all but four hundred and twenty acres. He was known as a hard worker and good manager. June 10, 1845, Mr. Greenwood was married to Miss Harriet Birge, whose parents were James and Abilena (Eaton) Birge, and both were natives of Vermont. They came to Illinois in 1834, and reached Greenville November 9. The journey was made by wagon and eight weeks were consumed on the way. They saw a great many deer and also some wolves. Mr. Birge made settlement near Greenville, on the old St. Louis road, where he became the owner of eighty acres and did much of the clearing and development of that place. He was a typical New Englander, of quiet disposition, but firm in his convictions. Mr. Birge died on his homestead about 1850, his wife having died in 1842, at the age of sixty years. She reared a family of seven children, and she and her husband were both members of the Presbyterian Church. In politics, Mr. Birge was a Whig. Mrs. Greenwood's early life was spent on the farm and she came here when fourteen years of age with her parents. She attended the district school in Vermont and spent several years in the old primitive log schools of this county after coming here. After marriage she settled here and has resided here ever since. Five children were born to her and her husband, four of whom are still living, namely: Elizabeth A.; Millard F.; Mary, who became Mrs. Henry Floyd; and Rebecca, who became Mrs. Arthur Wait. The death of Mr. Greenwood occurred August 22, 1886. He had been a consistent member of the Presbyterian Church, in which his wife still holds membership. A Republican in politics, he was always ready to uphold the principles of his party. Mrs. Greenwood carries on the work of the farm with the assistance of her son, Millard F., in an efficient manner since her husband's death. She has seen the most of the development of this part of the county and is very well known and much esteemed. Her husband has been much lamented by the whole community, as he was a man whose character was above reproach in every way and one who served as a fit representative of the best class of pioneers of this county. Extracted 29 Nov 2016 by Norma Hass from 1892 Portrait and Biographical Record of Montgomery and Bond Counties, Illinois, pages 128-129.